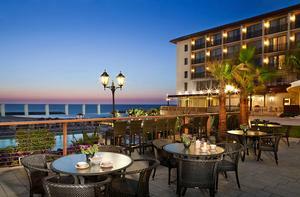 The Dan Accadia Hotel is Israel's Jewel On The Shores Of Mediterranean. The Perfect For Leisure And Corporate Travelers. Features Top Of The Line Recreational Facilities And Marina Activities. Minutes Away From Israel's "Silicon Valley" And Tel Aviv. A Diversity Of Restaurants, Giant Pool and Six Floodlit Tennis Courts Year-Round Attractions. The Ideal Place To Stroll At Midnight, Swin At Dawn, This Is Where Business Guests Can Relax supported By A Wide Range Of special Amenities. * for a fammily plan, when requesting a room for children alone, please book family plan as follows: FOR 2 ADULTS + UP TO 4 CHILDREN IN 2 ROOMS PLEASE BOOK: 2 ROOMS FOR 1 ADULT + MAXIMUM 2 CHILDREN EACH. (EXAMPLE - FOR 2 ADULTS + 3 CHILDREN: ONE ROOM FOR 1 ADULT + 1 CHILD & ONE ROOM FOR 1 ADULT + 2 CHILDREN) * Guests with a foreign nationality with a B2 or B3 visitors permit stamped in their foreign passport,are exempt from V.A.T. All other guests - Israelis - are charged 17% V.A.T according to prevailing Israeli law (excluding Eilat). Israeli citizens are aware of this law. All Rooms Include Safety Boxes and Mini Bar. 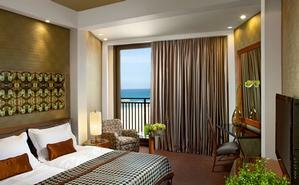 Deluxe Rooms - Facing Sea Or Sea And Pool. 2 Telephon Lines. Chalet 1st Floor - Facing Pool, Sea Or Marina With Balcony. 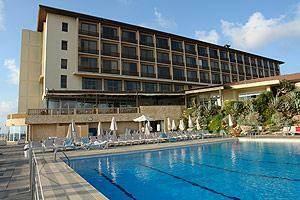 Free wireless internet access - high speed (WI-FI) in rooms and public areas. Dial up via an extra telephone line. Non-Smoking Rooms. The Dan Accadia Hotel Located On The Shores Of The Mediterranean Beach.Minutes Away From Israel's "Silicon Valley" And Tel Aviv. "Friendly, well kept, beautifully situated...."